St Edwards School, Romford, site of the successful 2005 Exhibition has been confirmed as the exhibition venue for 2006 and 2007. Mark Found enjoys his day at the exhibition! Mark Found, Discovery Home & Leisure presenter, writing on his own web site at www.markfound.com, describes his day at the I & WEMRC exhibition as 'brilliant'. He and his colleagues filmed plenty of footage, especially of our own club layouts, for a forthcoming series: The Wonderful World Of Railways. The second day of our 50th Annual I & WEMRC Exhibition. The moment we'd all been waiting for - at 10:00am the doors opened on the 50th Annual I & WEMRC Exhibition. New-look I & WEMRC web site goes live! 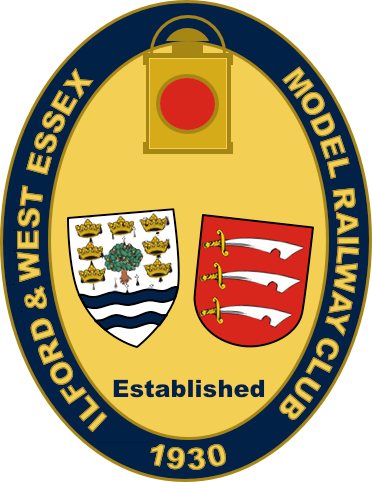 The club is pleased to announce the launch of the new web site, at www.iwemrc.org.uk, which we hope will make it easier for would-be members and enthusiasts in general to find and contact us. Many thanks on behalf of the club to Jonathan Casey for his work on the original club website, which got us started in the right direction, as well as his important and continuing work in getting the club's library organised and computerised. Mark Found, presenter of The Garden Railway, Supermodels 1 & 2 and Trainspotting, spent an afternoon filming at the club for a forthcoming DVD. 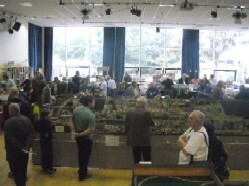 The club's 7¼" Gauge Minature Railway was the main subject of this filming, featuring our own Charlie Nelson on driving duties, and brief views of the inside of the club house. We are also expecting Mark at the exhibition. At our August Steam/Open Day, the Live Steam section were able to get Dave Prior's 'Thomas Junior' loco running, albeit not actually pulling passengers. A little work is needed, but it was good to see it running after many years in the engine shed.